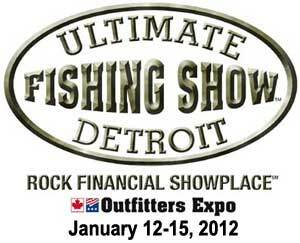 The 2012 Ultimate Fishing Show Detroit features an excellent ice fishing show with tackle, gear, seminars and a live weigh in. Ice angling enthusiasts will marvel at the expanded line of new products and new ice fishing seminars in this year’s Ultimate Fishing Show Detroit at the Novi Suburban Collection Showplace. Frank’s Great Outdoors is bringing a semi-trailer full of ice shanties, sonar tackle and accessories for hardwater action. Brand names include Clam, Eskimo, Frabil, Shappel, Otter and Markum. Other large ice fishing tackle vendors include Anglers Mart. Some companies, like StrikeMaster Ice Augers will have their own factory booths. Other companies are sending pro staffers to help Frank’s Great Outdoors handle the expected crowds. The expert seminar lineup includes top professional walleye angler Mark Martin with ice fishing for walleye, Capt Joe Raymer with ice fishing Lake Simcoe and Saginaw Bay, and outdoor writer and syndicated radio show host Dan Armitage with basic ice fishing. Check seminar times and locations on the Ultimate Fishing Show seminars page. Also new for 2012, the first ever Ultimate Ice Fishing Tournament pits 20 top regional ice fishing teams in a live weigh in for the Ultimate Ice Fishing National Championship title. Anglers will fish local lakes and bring their big catch to the Suburban Collection Showplace for the ice fishing show down – the first ever held at a sport show venue. The anglers will be focusing on a 10 fish limit of panfish including crappie and bluegills. There will also be a Bear Creek Monster Pike award for the largest pike brought to the scales. For information on how to pre-qualify for the weigh-in contact Jack at jackhorning@sbcglobal.net. Sponsors for the Ultimate Ice Fishing Tournament include K&E Tackle and Skandia Tungsten Ice Jigs.